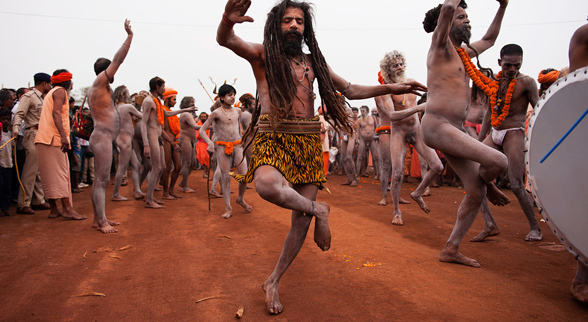 India is incomplete without its vibrancy that´s stored in the unique and the queer lifestyle of the tribes. India has lots of untouched, unhurried, and unexplored Rural and Tribal destinations for you. Even today, every Indian tribal group holds an inheritance of traditions, which are deeply rooted in their culture and lifestyle. It will take you away from the chaos of the city and town to the calm and peaceful place where people still believe in living a simple life just like their ancestors did. Away from the regular city life, these tribes wake up every day with new challenges. Each one is different from its counterparts in their unique rustic ways and a self-defined set of culture, rules, and customs. Often termed as the ‘modern early person’ these tribes showcase the courage of living a hard life with limited resources. There is much to learn from them. This is a very special & fixed departure tour program comprising Rajim Kumbh Mela. The major tribal groups in India include Gonds, Santhals, Khasis, Angamis, Bhils, Rabari, Bhutias, and Great Andamanese. Major tribal regions are located in Odisha, Gujarat, Arunachal Pradesh, Nagaland, Manipur, Rajasthan, Meghalaya, Maharashtra, Assam, Chhattisgarh. When some tribes of India are well known for colorful costume & ornamentation, some of the rich culture and colorful festival, and some for music & dance. The rural color with mud walls and thatched roof houses, earthen pots, traditional wears – men in dhoti and women in sari, ornaments (made of cowries, shells, bones, mixed metals, copper and bronze), and Kutki (staple food) are the main attractions of the Gonds tribe. Baneshwar Fair is the main attraction of Bhil tribe. Tribe women of Odisha wear a lengthy cloth material that they wrap around themselves, girls are seen with tattoos on their faces. The tribes of Jharkhand use bamboo for making baskets,hunting & fishing. They have tattoos called Godna, on their bodies instead of wearing ornaments. Bow and arrow are the symbolic weapons of the tribe of Jharkhand. All other tribes also have their own culture, traditions, languages, and lifestyle. This enables you to get an insight into many different cultures at the same time on the tribal tour to India. India Tribal Tours give you a chance to explore the ethnic life of Tribes of India. You can experience the culture of different colorful tribes, their village life, exploring art & craft and textile of different tribes of India in HTOI’s India Tribal Tours. The HTOI’s India tribal tours are more refreshing and energising.